Say you want to start a local brewery. You network with local farmers, you have access to local grains, there’s nothing stopping you. Au contrare, my friend. In order to make the grains usable in the beer brewing process, they must first be malted. Did you know that if you live in Massachusetts, the closest malthouses are in Canada or Wisconsin? That’s where Valley Malt saw their opportunity. Valley Malt has a similar story to the one described above. Andrea and Christian Stanley were considering starting a brewery in the area, and were unimpressed that there were no resources for local breweries to access a malthouse south of Canada. After visiting malthouses in the West, as well as the UK, they decided to become the first (modern) master malters of Massachusetts. As Andrea put it, they thought “how hard could that be?” and dove right in. Pretty hard, it seems. I was so impressed with the detailed play-by-play Andrea gave us to help us understand the process of malting. The barley (or specialty grains such as rye, wheat, spelt, etc) are first harvested, either by several local farms or by themselves. They are then cleaned by a vintage “Clipper” (from the 1920s! ), which removes undesirable seeds or other excess plant materials. The resulting grains are then either stored or malted, which is a process that lasts for about eight days. The first 48 hours are crucial – this is when the grains are steeped in water to increase the moisture content and bring the grains “back to life”. After this period, once the seeds have begun respirating/growing, they must bring the moisture back down just before the plant breaks through the seed. Seems redundant right? It all “boils” down to this: in order for a seed to grow, it needs food. This “food” (starch) is stored inside the endosperm. Starch is what brewers need to make beer. Thus, the seeds are brought into germination just long enough to expose the starches but before they are used by the seed. They are then deprived of moisture, which halts the germination/growing, through exposure to hot, blowing air. This process of drying out the grains and bringing the moisture content back down is called “kilning”. The coolest thing I learned about malting? The temperature at which the grains are kilned determines what type of beer it becomes! Valley Malt has come a long way. They started malting in their own kitchen, studying textbooks and learning everything they could. 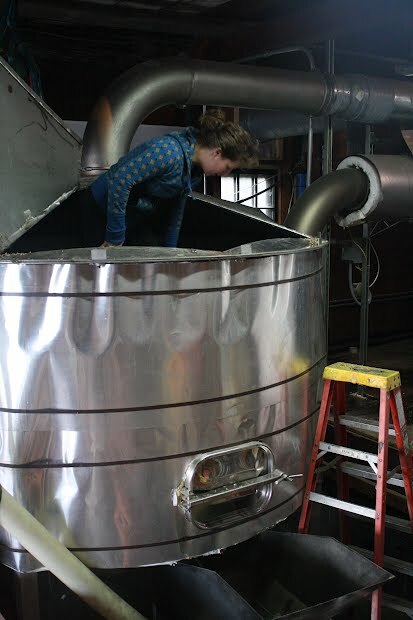 Their current malthouse houses a 1-ton malting unit, which is soon to be upgraded to a whopping 4-ton unit. They have established relationships with several local breweries (Wormtown Brewery, Cambridge Brewery, Peak Organic, and Allegash just name a few). They have definitely made a huge impact on the brewing world here in Massachusetts by carrying on the tradition of malting in Hadley. After doing some careful research, they were able to find evidence of malthouses in Hadley as far back as the 1600′s. For this reason, they grow and preserve heirloom barley varieties to honor the rich history of malting in the Pioneer Valley. This power couple also grows their own grains right behind the malthouse. Sam and I got to observe the dormant winter grain crops, eager for warmth and sunshine. In Massachusetts, Andrea described, winter grain crops are more desirable so that they can be harvested at the beginning of July, just in time to avoid pests and weeds. 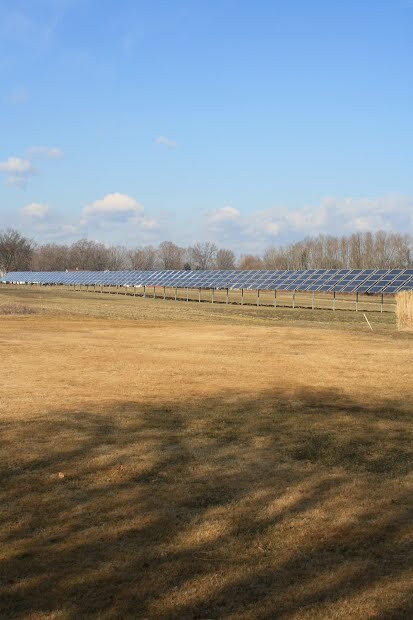 They share the field with their neighbor’s solar panel project, from whom they purchase their energy for the malthouse. 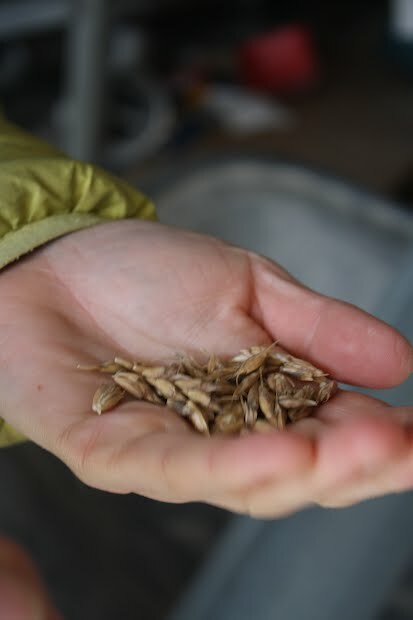 Before we concluded our visit, Andrea indulged us with some of her favorite malting experiments. Her seasonal favorites included local cider malts in the fall, and local maple sap malts in the winter. 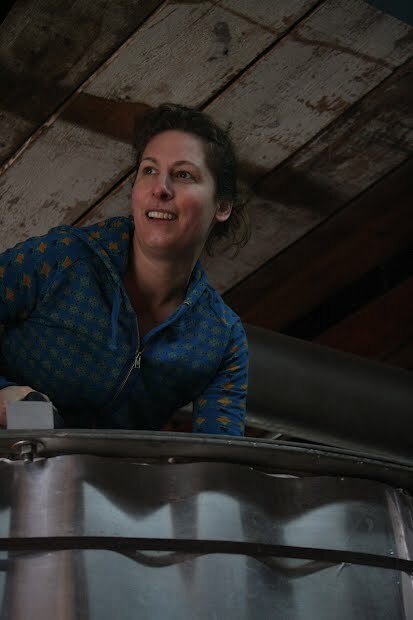 Once she started describing her attempt to make a chamomile-infused malt, my heart skipped a beat… I can’t imagine a more perfect intersection of my two favorite things: herbs and beer. Valley Malt is doing it for themselves. They saw an opportunity to get involved with the local food community in an innovative way. They provide a resource that was previously unavailable or unsustainable to local beer enthusiasts. They are able to bridge the gap between local farms and local beer, they are the missing link. This entry was posted in Food Warrior Interns, In the Pantry (food artisans) and tagged ali touloupas, Beer, brewery, food warriors, malters, malting, Real Time Farms, valley malt. Bookmark the permalink. Fabulous work guys! Truly something we can boast in the northeast!